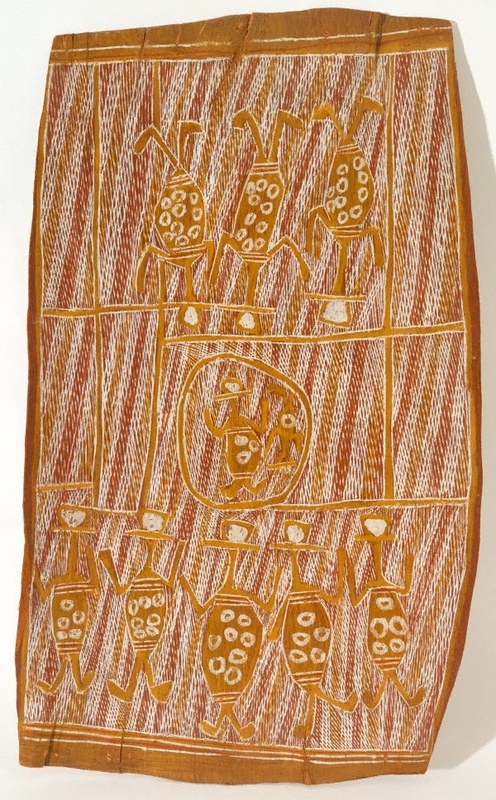 Bob Bilinyara was central to the group of artists working in Milingimbi in the 1950s. Like Makani he later resided in Maningrida, where he played a leading role mentoring younger artists, and also at Nangalala. He was among the group of Yolngu men enlisted as part of Donald Thompson’s Special Reconnaissance Unit, charged with protecting Australia’s northern coastline during the later stages of World War II. Bilinyara was also a respected surgeon; in this work, he gives figurative form to those involved in an initiation ceremony.